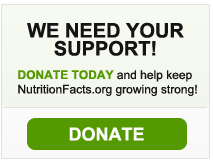 NutritionFacts website is a great one to subscribe to. Today it sent me an explanation of the cause of Hiatal Hernias -- a portion of the stomach goes up into the esophagus -- with a video showing how that happens due to straining at stool-time. See email below. What I would take away is we want to avoid straining at stool-time. The best way to do this is eat a high-fiber plant based diet. The failure to do so is what likely causes hiatal hernias in the first place. Such a diet also reduces acid reflux, and various cancers. I also recommend for $24 a Squatty Potty...Amazon link. This stool raises the knees to a higher level, and thus reduces strain at stool time. My wife -- trained as a personal trainer -- also recommends a few squats before going on the stool to loosen up as well. Jun 26, 2015 06:00 am | Michael Greger M.D. Saturated fat can be toxic to the insulin-producing beta cells in the pancreas, explaining why animal fat consumption can impair insulin secretion, not just insulin sensitivity. Jun 24, 2015 07:00 am | Michael Greger M.D. Jun 22, 2015 07:00 am | Michael Greger M.D. Copyright © 2015 NutritionFacts.org, All rights reserved. You are receiving this e-mail because you opted in at our website. Work out online. If you’re not sure where to start without a personal trainer to guide you, check out the American Council on Exercise’s free fitness library. The step-by-step instructions for exercises for every body part — abs, hips, shoulders, arms, and more — will having you toning at home in no time. Many ACE exercises don’t require equipment; for the ones that do, consider investing in a pair of free weights, or improvise by holding canned foods or gallons of water in each hand. For individual exercises at ACE, see this link. Vegeterians Org has a webpage where you can find Vegeterian restaurans in your state by city location.